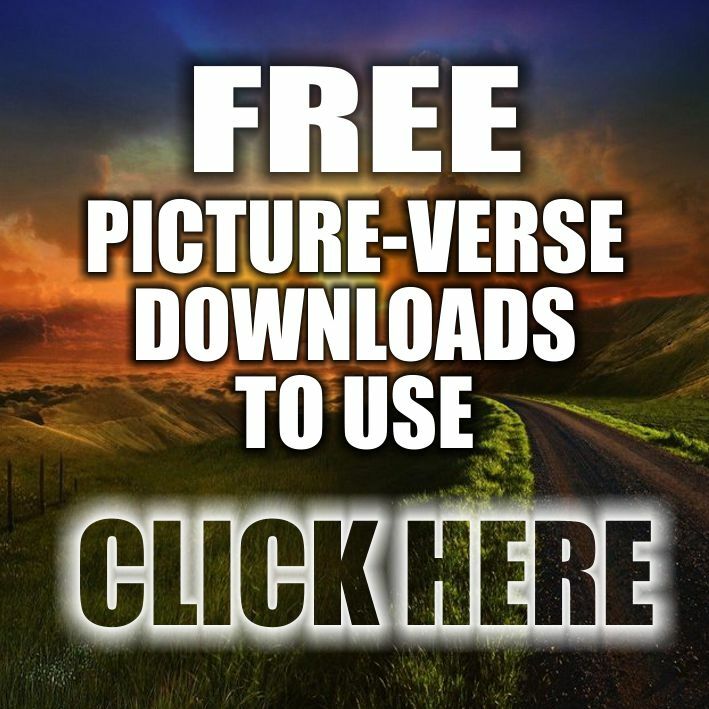 HalleluYah for HalleluYah Scriptures – Let Us Praise The Father! Please join with us in praising the Father for the wonder He has done with the gift of His Word the HalleluYah Scriptures. Wow, where to begin! We have witnessed so many miracles from the Father and He never stops amazing us with all that He organizes and puts in place. We are often moved to tears when we see just how faithful and loving our Almighty Father is toward those whom love and seek Him. This project is made up of His people from all over the world whom are seeking His will, either through receiving His Restored Word for the first time, or helping another receive such a gift. We as a team are merely vessels — His servants striving simply to do what He leads us to do. Our only focus is to get His Word out to His people and indeed it is He who has set this project in motion and is continuing to move it forward at a feverish pace, halleluYah! We are continually amazed when we read the stories of how brothers and sisters are led to HS to receive His Word, true miracles, truly stunning ways the Father’s Ruach is moving in hearts and minds. In this newsletter, we’ll share a bit about the ways He’s reaching His children, the heart of this mission, the HS teams, and the latest happenings. 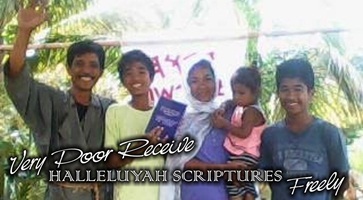 As always thank you, halleluYah for those of you joining us in this mission to reach the four corners of the earth with the Father’s gift, the HalleluYah Scriptures. We believe that those who sell His Word have sold themselves out cheaply. You never saw the Savior sell His Father out for anything, He never charged for the hours and days He preached the Fathers truth. We believe that when the Father “barak” a project and His hand is upon it He will provide everything and every step of the way. No good works allows anyone to break His Torah or make excuses to break His Torah. It is such an honor to work for the Almightly. HalleluYah!!! Now you can’t believe this friends, the man who drove the truck was an assignment from The Father! He was asking who we were and what we do and we began to tell him about the Savior and Torah never was “done away with”. He told us that The Father had him leave (he, his wife & 7 children) church and worship at home, and have nothing to do with Christmas and Easter and other pagan days. This man was so happy to hear WHY now, HALLELUYAH! He wanted any information we had, said he knew there was so much more and had been just following the Ruach’s lead. Can you believe this? 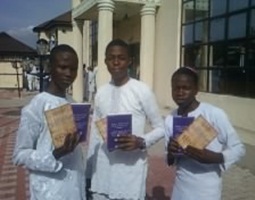 He was just like a sponge, he knew his Scriptures very well and we had a wonderful time of fellowship as we stacked up 10,000 HalleluYah Scriptures. (He even wanted to help us stack for no extra charge).We prayed for him before he left and gave him one of our copies of HalleluYah Scriptures, which, he opened immediately asking about the Fathers name in Paleo Hebrew and declared, “Oh, it even has a New testament!” (sparking another conversation about “Renewed”). This was a miracle day friends. The Father hand selected him to be the driver for a reason. He can’t WAIT to tell his family that TORAH is not done away with! So, all my worry was for nothing. Do you know I had 20 minutes sleep all night? I became ill and had troubling dreams… now I know why. ONE MORE SHEEP of the House of Israel has been found!! I told him that what he was doing was prophetic as he was helping us hand the boxes down from the truck; that he was going to be put to work “feeding YHWH lost sheep.” He smiled and said, AMEIN! HalleluYah! Please keep this family in your prayers as they venture onto a new path of truth. May all the Father’s lost seeking sheep find their way back to Him in whatever way He wills! 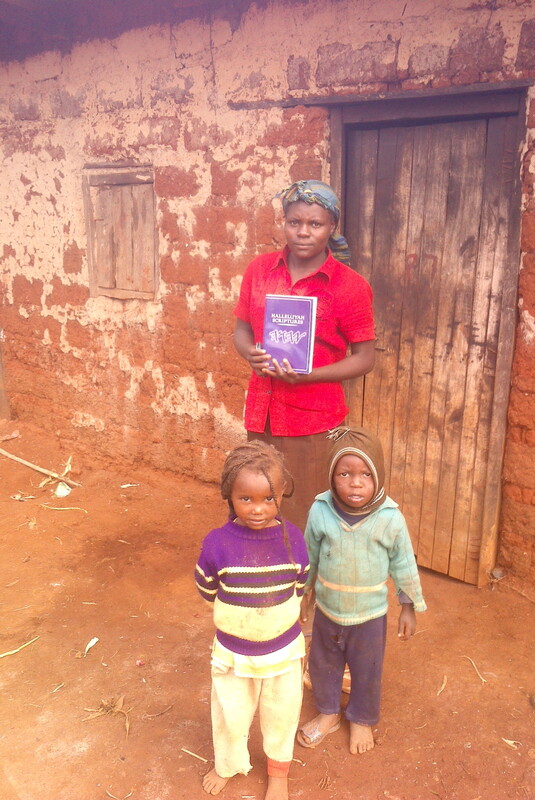 We hope all will seek to understand the heart of the HalleluYah Scriptures project is to help those who have never had a copy and whom cannot afford to receive a copy, as we do not have unlimited supply. This is Scripture and the true heart of the Father. Those that can afford help those that cannot afford. There is no better gift you can give His people than His love letter His Word the HalleluYah Scriptures it is everlasting and lasts a lifetime, it has all the answers and gives hope and joy. These are good seeds that you would be sowing. When you give you give to the Father not to any one person on this team. Your gift goes to His Word not on profits or supporting someone’s lifestyle. We are eagerly trying to get out copies to those whom are in desperate need and have been waiting for many years, those whom have never seen or owned a copy of His Word and if this describes you please let us know. As well, if this does not describe your current situation and/or you already have a copy of His Restored Name Scriptures, please prayerfully consider donating to this Kingdom work where we are endeavoring to reach the four corners of the earth with the Father’s gift of the HalleluYah Scriptures. Contact us and let us know how you are able to support, whether through prayer, fasting, promoting, donating, or however the Father may lead you... truly we cherish and deeply appreciate all forms of contribution. 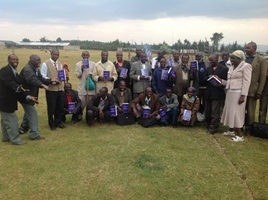 While many can readily afford to have a copy of His Restored Name Scriptures, there are many other brothers and sisters whom are sharing one copy among 10 believers; so we are striving to get copies to the multitude of our brothers and sisters all over the world who are in desperate need and have been crying out to the Father for His Word. 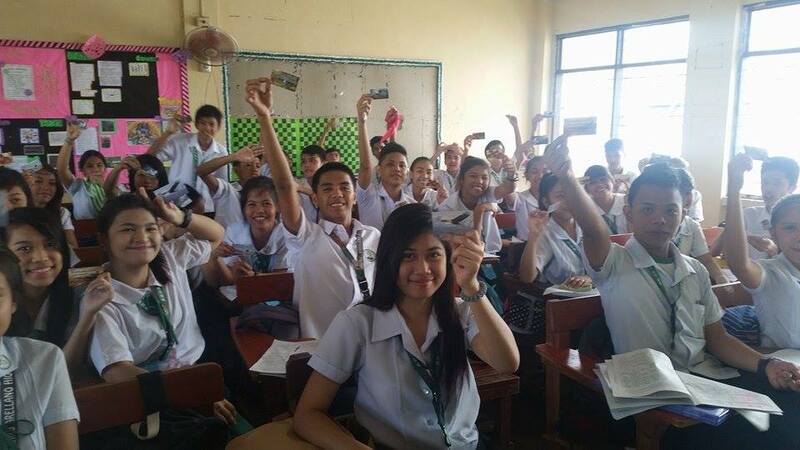 Indeed, 90% of the HS goes to those whom DO NOT donate. HalleluYah, HS is reaching prisoners, homeless, missionaries, Africa, Philippines, Russians, Yisrael, Native Indians and those who truly do not have the means to contribute financially. Bottom line: HalleluYah Scriptures is not for sale and is never to be sold... the project is funded by His people whom can afford for His people whom cannot. It is this simple. 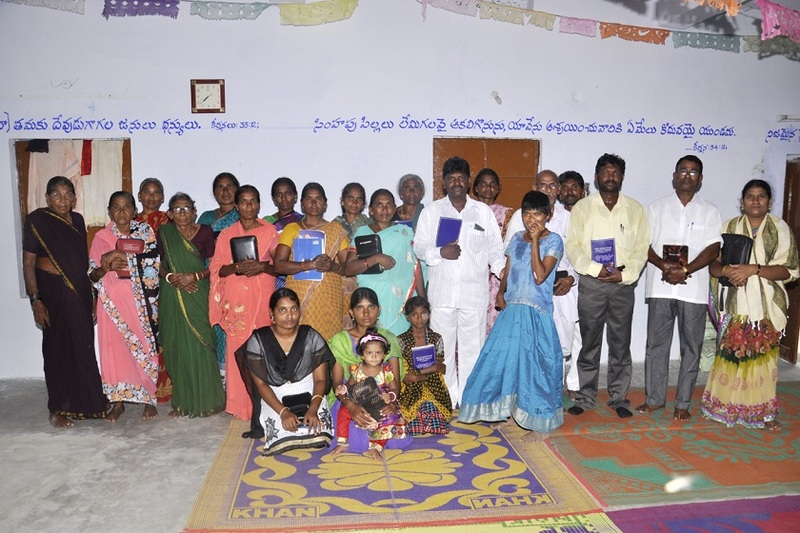 This project is not simply about helping ourselves attain the best Restored Name translation, but the Father’s other seeking needy children as well, those whom cannot financially afford a copy. Truly this is the heart of the Father and the heart of this project: giving and in turn receiving, rather than simply receiving for ourselves, halleluYah. The Father has clearly instructed us to diligently discern where His Word is to go. He charged us with this responsibility and we strive to follow His will for this project and what He has called each of us to do. We pray and fast daily over the orders and seek wisdom over every request. We are not in the position to give to every single person whom asks, as we do not have unlimited supply. We hope this gives you an idea of how HS operates, strictly according to the Father’s will. 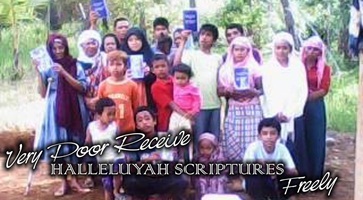 Although rare, we do receive requests from some whom have a copy of a number of Restored Name Scriptures, are not in financial distress, request a copy (or several), yet offer no support of any kind to the HS project, then when they do not receive a copy, they demand, accuse and threaten... extremely disappointing behavior, but true nonetheless. We know the enemy will use anyone to try and come across this project as the enemy hates His Word. In this circumstance, we fear the heart of the project is not understood, or simply ignored for whatever reason. In light of this, if you haven’t already, or for further inspiration and encouragement, please view our videos to fully grasp the true heart of this awesome, history-in-the-making project and if you are seeking a copy, while offering nothing in return when you are able, rather than attack and question your fellow brethren whom are merely tools and vessels, please seek the Father to answer your questions on why you may not be receiving a copy; as truly, it is He who provides or withholds, we are only servants accountable for every copy and donation that His children entrust us with and we answer to Him for heeding His instruction regarding discernment in distribution. 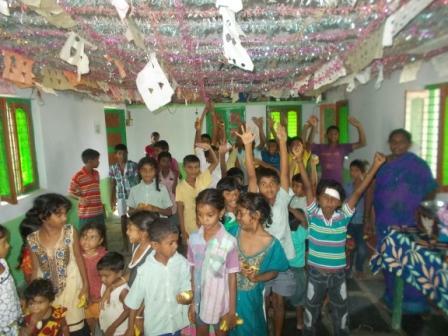 We are called to reach His desperately needy children first and foremost. With this in mind, we fervently encourage all to seek to understand the heart of this project, as without His eyes, we cannot see the vision. We abundantly thank each of you, halleluYah for all of your support, patience and understanding in this work we’ve been called to complete... may our Father be well-pleased. The HS main team and helpers are scattered all over the world and offer their services, time, equipment and all contributions willingly, voluntarily and for NO COMPENSATION OR PUBLIC RECOGNITION. The core team has left all for this project, working full-time, sometimes up to 16 hours a day, 6 days per week. We write this not for thanks or esteem, but for understanding that ALL funds go to printing and shipping ONLY, and all efforts go toward continuing the original vision that the Father gave for this work of restoring His Name to His Book and NOT selling it. 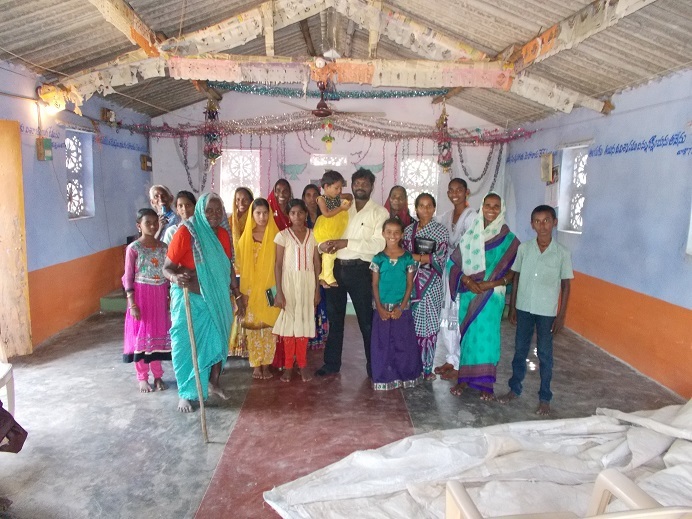 The Father handpicked each founder and helper to see this Kingdom work completed. We operate under His covering and direction, and His alone. It is He who provides, protects and directs each and every decision made. The team and helpers are in constant prayer and fasting and there is no decision made without fervently seeking the Father first. Furthermore, the team members and helpers do not want praise or recognition for the work they are doing for the Father, period, there is no need to advertise one another, as this work is not about any one of us, but about the Father and getting His Word to His children. As stated above, we strive to operate according to the desire of the Father; we are accountable to Him and it is to Him alone that we answer. For those whom do not understand the way HS operates or the heart of the team, please seek to understand the heart of the Father, as it is the same, halleluYah. Understandably, when considering the nature of our endeavor, this task is not always easy, however it is one He undoubtedly gave us as a team and we seek to accomplish it with our utmost abilities and tireless efforts despite all obstacles. We appreciate all those whom support these efforts and we pray the Father will open the eyes and hearts of all those whom do not. May His Will Be Done, halleluYah! How can we possibly sufficiently articulate just how wonderful, faithful, generous, kind, thoughtful and self-less the supporters of the HalleluYah Scriptures project are! HalleluYah indeed, as it is His Ruach moving in His children’s hearts and it is marvelous to see. We receive hundreds of encouraging and refreshing emails each week and we are so barak to receive them. All praise, honor and esteem to the Almighty for your messages, your kind words and testimonies of how the Father is working in your lives continue to inspire us immensely. Keep ‘em coming! Truly, many of them move us to tears as we are in awe of the prophetic times in which we are living, and how barak and unworthy we feel to do this work for Him and His Son. We read emails from all over the world from His children describing their love for the Almighty and how He’s led them to HS—truly remarkable, miraculous stories of how the Father is seeking out His lost sheep and leading them to His Word, the HalleluYah Scriptures. Indeed, never before in the history of the printed Word has there been a Scriptures with His Name restored and done according to His instruction not to sell; truly, take a moment and think upon the magnitude of this movement of His Ruach, indeed we are witnessing His promise to Restore! HalleluYah, what exciting times in which our generation lives! 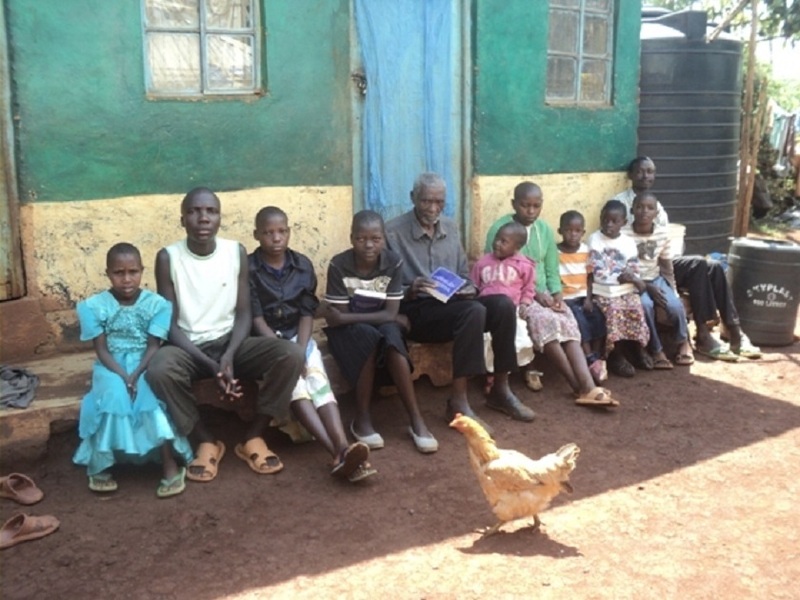 This is a project that belongs to Him and is being accomplished through His children for His children. 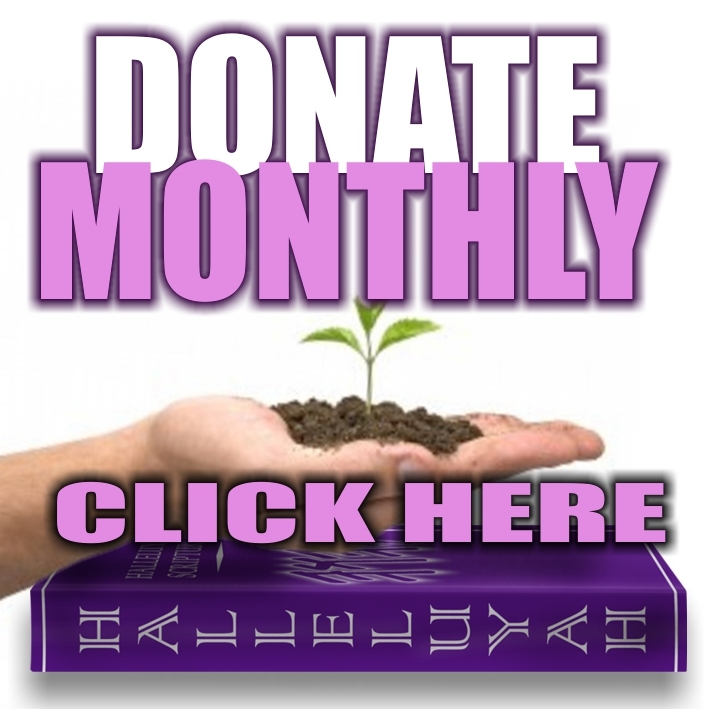 Many of you join us from all over the world in regular prayer, fasting, promoting, and funding of this prophetic endeavor and to this self-less generosity, we want to take the time and say a HUGE THANKS, HALLELUYAH! May the Father abundantly barak you as you are a berakah unto others. Your efforts are truly appreciated, as HS could not be done without the Father’s faithful rising to the occasion. 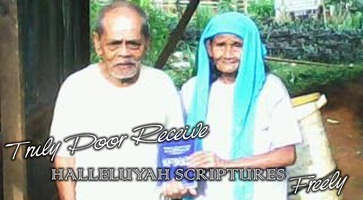 For all of you whom contact us to encourage us, it is truly touching and inspiring, thank you, halleluYah. Please know, our only focus is on the calling to get His Word to those whom need it, we have no other agenda or plans but rather have answered His call by giving our lives to the Father and His Word. So again, thank you to all of our faithful supporters, halleluYah, as it is His people that hear the voice of His Ruach and are acting upon what they hear; indeed it is you that He has used to provide for His people and oh what an honor and joy to serve together for our Father’s Kingdom. Indeed, we have each been raised up for such a time as this, we know you have done this for the Father and not us on the HS team or any other human.....HalleluYaH! The HalleluYah Scriptures project is made up of His children from all over the world, including you, laboring together in our Father’s vineyard combining our individual efforts and abilities to bring forth His harvest, halleluYah! The following are some of the HS teams and the work they do. 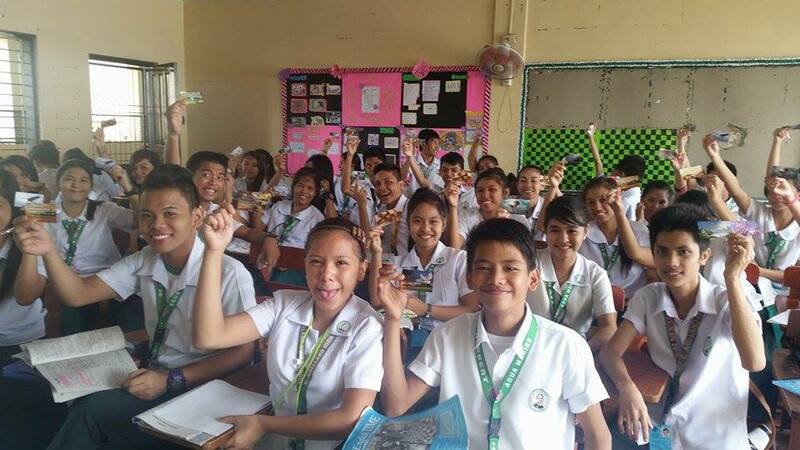 Again, we share not for any praise but to show you how the Father has gathered His children to do this important work, all praise to the only One whom is worthy! 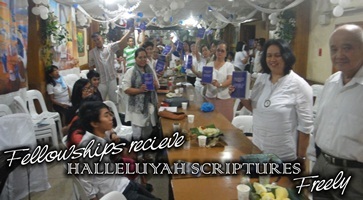 TRANSLATION TEAM: work full time on the HalleluYah Scriptures. They are now learning Greek and Aramaic to get a better understanding of the RC. Many may not understand the work that goes into a translation. Just removing 80% of Italicized (added) words took a number of years as you cannot just take them out as it has to still be readable for a person, each work had to be examined and studied, every pagan word pertaining to the Father His Son and His people had to be translation to Hebrew as the Father made it very clear that He did not want any pagan words associated with Him, His Son and people, so these all had to be studied and researched. You will also see in the new video that two more verses have been added as they were in the DSS but no other version has these two verses. All we want is His Word as pure and as close as we can get to the Hebrew for His people. 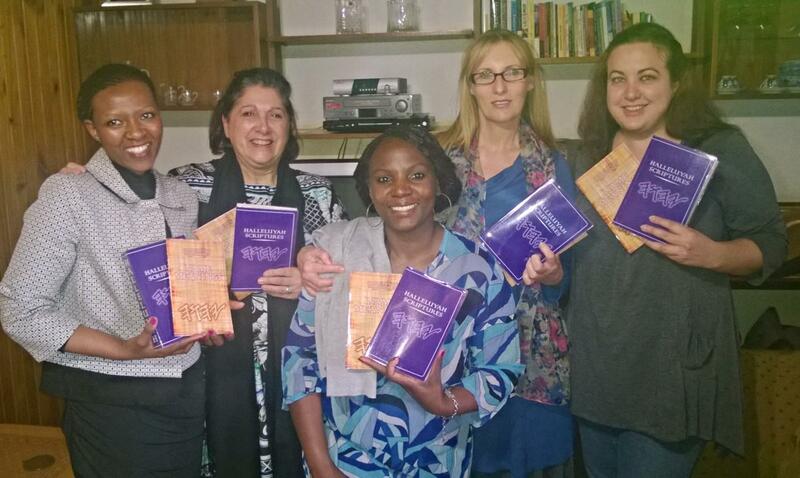 SPANISH TRANSLATION TEAM: This team works diligently on the Spanish translation of the HalleluYah Scriptures. This is not an easy job as there is so much paganism in the Spanish language and much of it is Catholic. 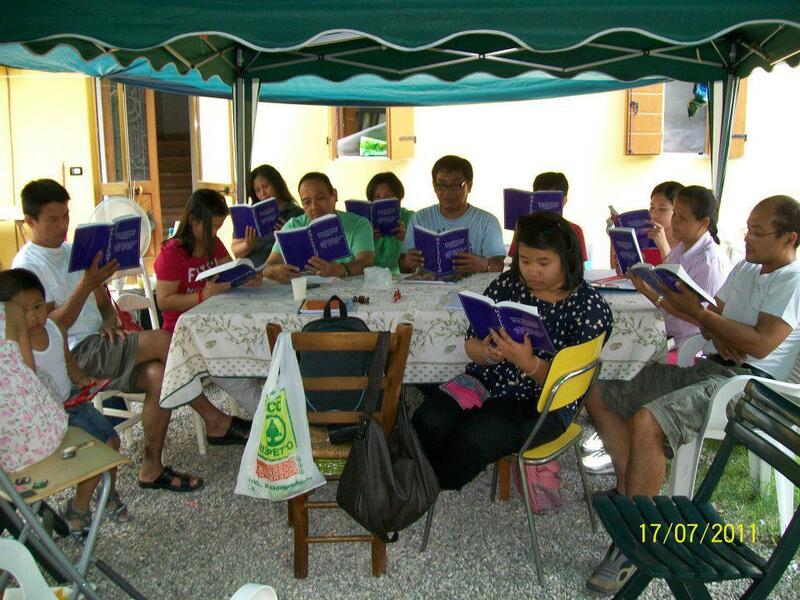 We are asked for the Spanish translation of the HalleluYah Scriptures every week, it is so popular. This will take some time to complete but once completed, it will reach His people who do not read English. 3. PRAYER AND FASTING TEAM: HalleluYah, we now have over 500 brothers and sisters who join with us to fast and or pray once a month. 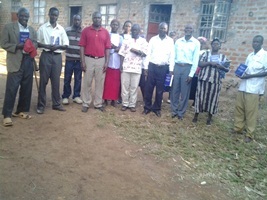 Theses supporters give of their time unconditional each month as they know that Prayer and or Fasting is so important for the project and the team. We are so barak by all those that come together each month at this time worldwide. 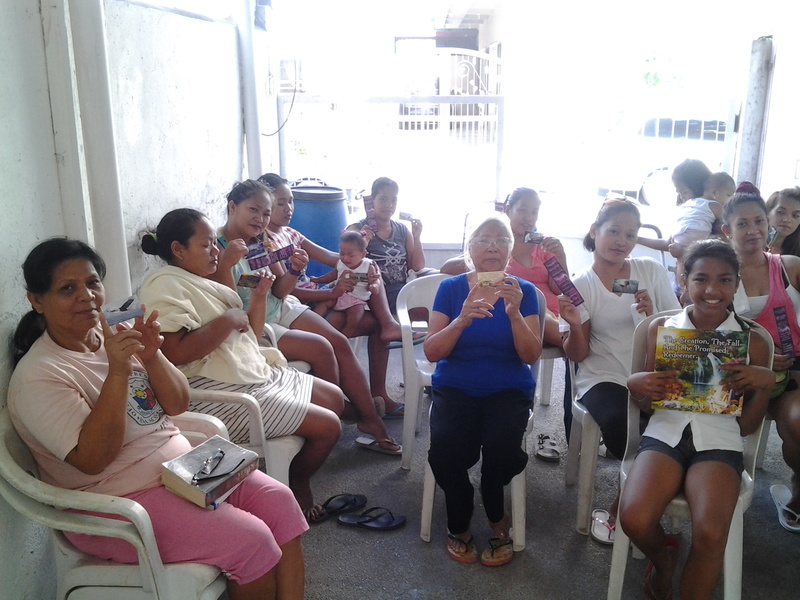 This team works in keeping everyone updated with much of what is happening with the project and the prayer needs. 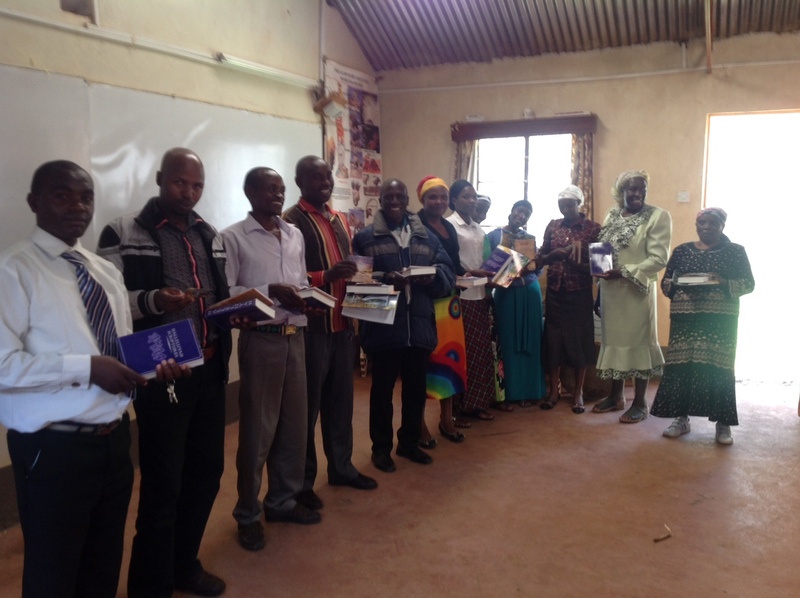 MISSIONS TEAM: works on prison libraries to get His Word the HalleluYah Scriptures into all the prisons first in the USA, while also talking with the chaplins to send extra stock to them for their prison ministry work. HalleluYah, with the new shipment, the HS will have delivered 4000 HS into prisons to prisoners whom are seeking to follow His Ways! 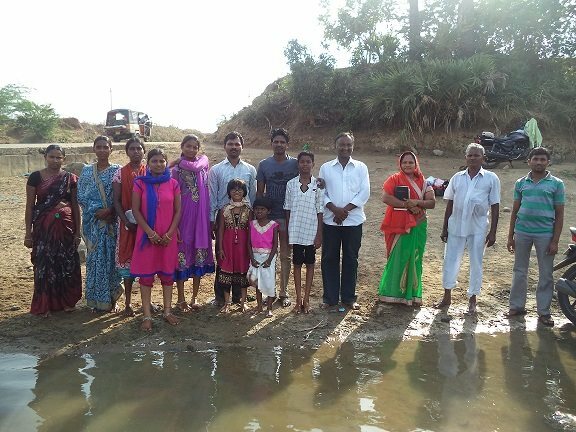 The Missions team also searches out His people in different countries to receive His Word, while diligently tracking down fellowships to share with them about this important project. Please, if you have contact details for fellowships and groups in your area can you kindly let us know as the more contact information we have the more brothers and sisters we can reach. Furthermore, and quite importantly, this team is responsible for looking after the daily prayer group, enabling this project to be covered in prayer all day, every day, halleluYah! WEBMASTER TEAM: A number of you may not have seen the new revamped web site, the web master has been working hard on the site and we have received so many emails saying that people enjoy the site and how alive it is, halleluYah. The project has been barak by a wonderful web master who we treasure as his job is not easy. If you have not seen the new site then please have a look around it! BULK AGENTS: around the world work hard to get all the orders out! 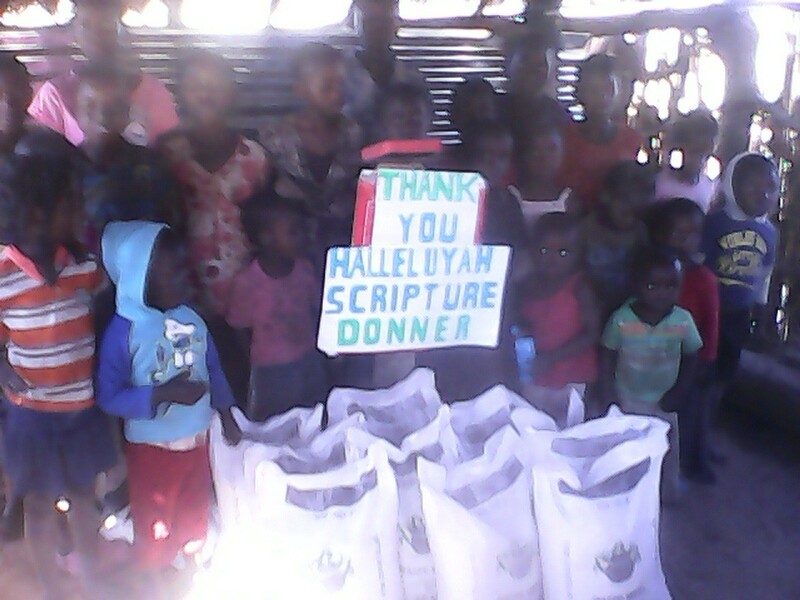 Ninety percent of the HalleluYah Scriptures go to those that do not donate. Prisoners, homeless, brothers and sisters in 3rd World Countries and those that have never seen or owned a copy and cannot afford. 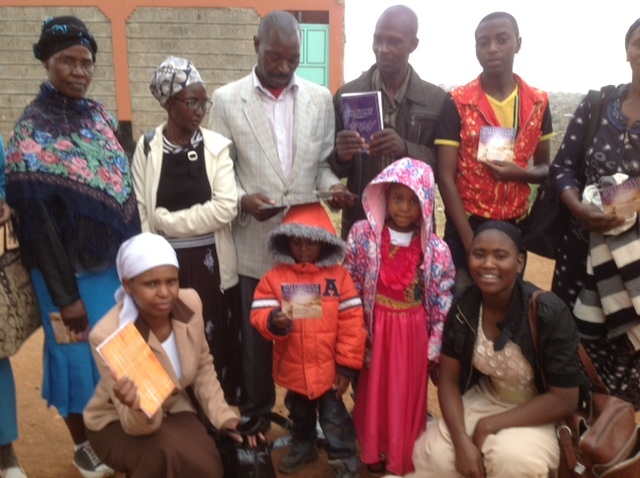 New believers also receive copies. 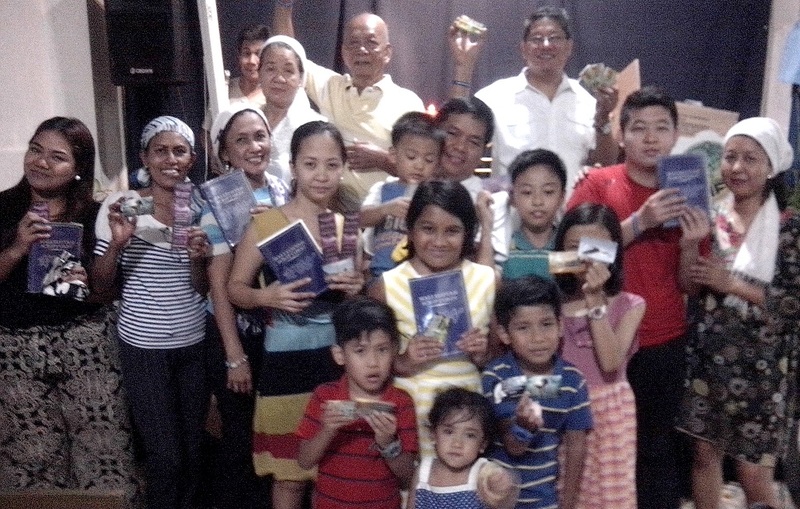 Praise the Father for these people and their families as they work hard for you His people. 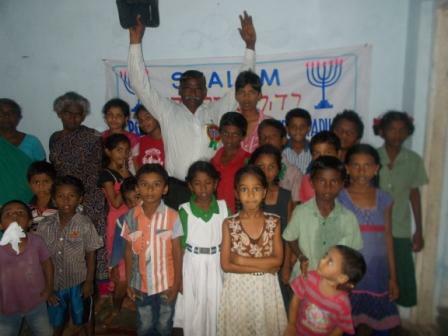 DONATIONS TEAM: This team, who is independent from HalleluYah Scriptures, has looked after the donations from the beginning. Their job is to look after the pay pal account, bank account, keep everything up to date and orderly; additionally, they deal with the printer when it comes time to pay them and the postage fees. We are so thankful to them, halleluYah, like all the others teams, they do an excellent job. 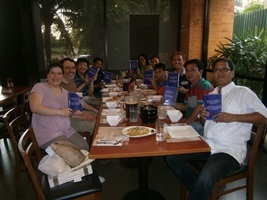 EBOOK TEAM: works long hours on this program...they just completed adding the HalleluYah Scriptures to the ebook. That took them 6 months as some fonts had to be designed for the program. They are working on the Spanish ebook now so when a chapter or book is completed in Spanish it will be added to the ebook. *Spanish Ebook Update: HalleluYah, we are praying this will be completed this month! Each time the team completes a Chapter or book it will be added to the Spanish ebook. The Spanish translation is asked for every week if not daily. There are so many that only speak and understand Spanish and are in need of this translation. Please keep this in your prayers and if you feel led to help, please contact us as the Spanish translation team are always looking for others to help with this most important task. EMAIL TEAM: deals with all the emails –orders, questions, and anything that comes through email. We are receiving hundreds of emails a week and sometimes it can take a little longer to get back to you but we truly do our best...thank you for your patience and understanding. GRAPHICS and VIDEO TEAM: this team works on some of the graphics for the web site and videos, all the graphics you see in the videos are done by this team. They are currently working on new videos for you to view and enjoy. There will be a revamp of all the videos in the near future. HELPERS: We have other volunteers that freely give of their time and we are so grateful to them. It is a team effort on all our parts. There are those that continually pray, fast and donate and each of these are so important because without them we would not have gotten this far. Again, we are all a team working together for one goal - for our Father, halleluYah! HalleluYah! 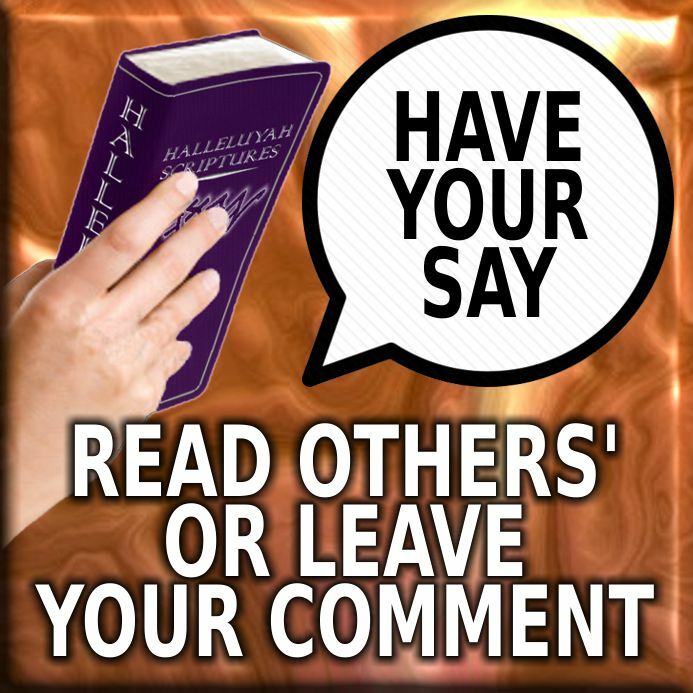 We have shared with you that a number of brother and sisters from all over the world have emailed us to say they have had dreams about the HalleluYah Scriptures being a bright light of truth to the Yahudim in the end times. As we’ve shared, we as a team are in constant prayer and fasting each day to be directed in wisdom by His Ruach. We have given up our lives for this project. We give it our all as we know it is that important and feel such urgency. We ask nothing for ourselves and do not want thanks or praise as it all belongs to the Father for He has done wonderful things. 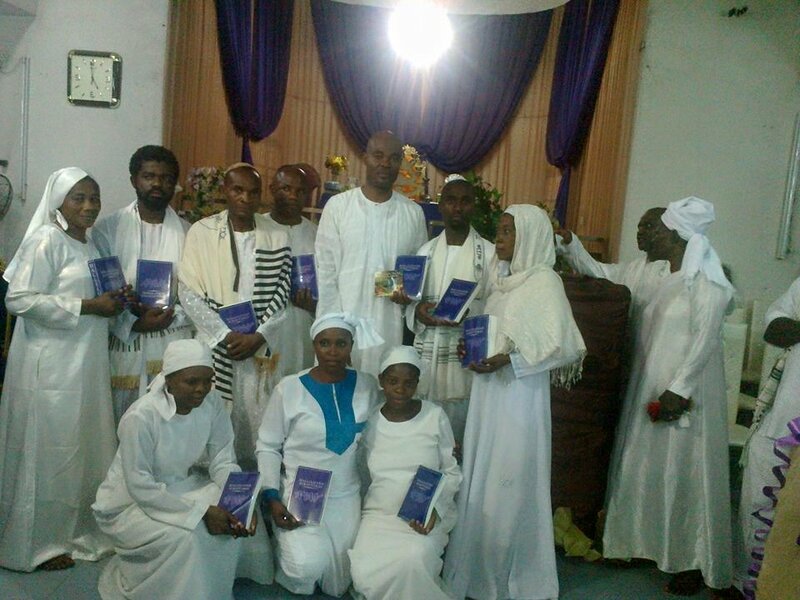 One of these wonderful things that He’s put on our hearts was to have a group in Yisrael that can take the HalleluYah Scriptures in bulk so that when the Yahudim come to know the Savior, His Word is there for them to receive a copy. We had been praying for the right person and for the Father to lead the right people for this job, halleluYah, He has! Please read about this on the HalleluYah Scriptures site as the Father heard our cries and answered us without us even asking or advertising for someone! A brother who is an Yisraelite born and bred, who lives in Yisrael but travels a number of times to the Usa as he is part of a Ministry that reaches the Native American with His Name and Torah, contacted us to ask for a few copies for the Native Indians, this is how we met him. 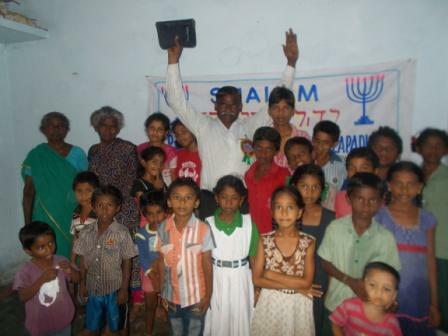 So we are so barak that we now have people in Yisrael who can be the bulk agents and also reaching the Native Indians! This is wonderful and only can be of the Father, halleluYah. 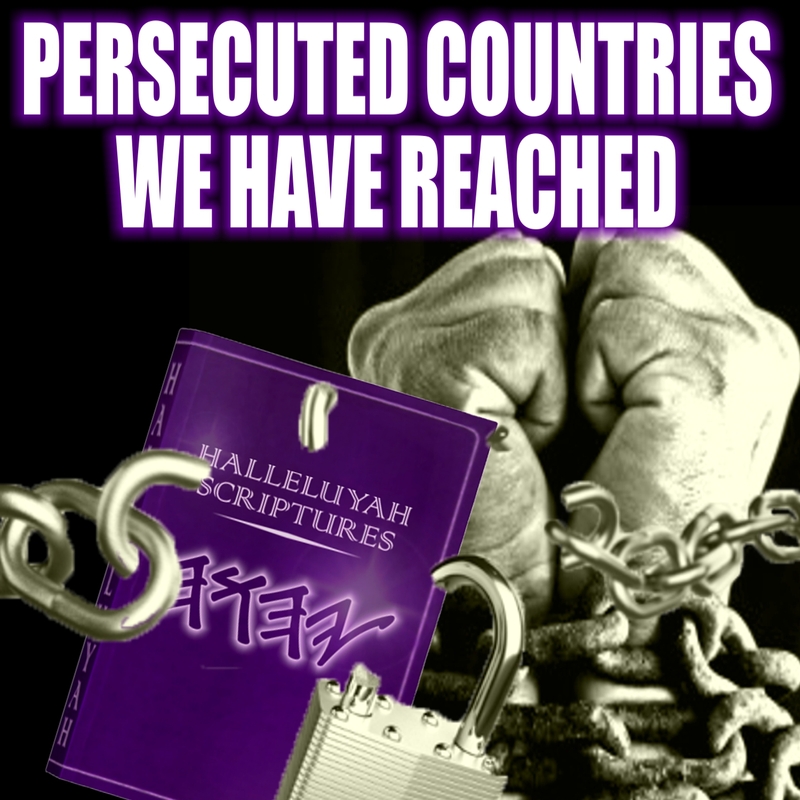 We know a time is coming soon when there will be a lock down and nothing will go into Yisrael...the brother also mentioned this so, through prayer we sought the Father and asked how many copies we should get into Yisrael as soon as possible and we felt that 2000 would be good. 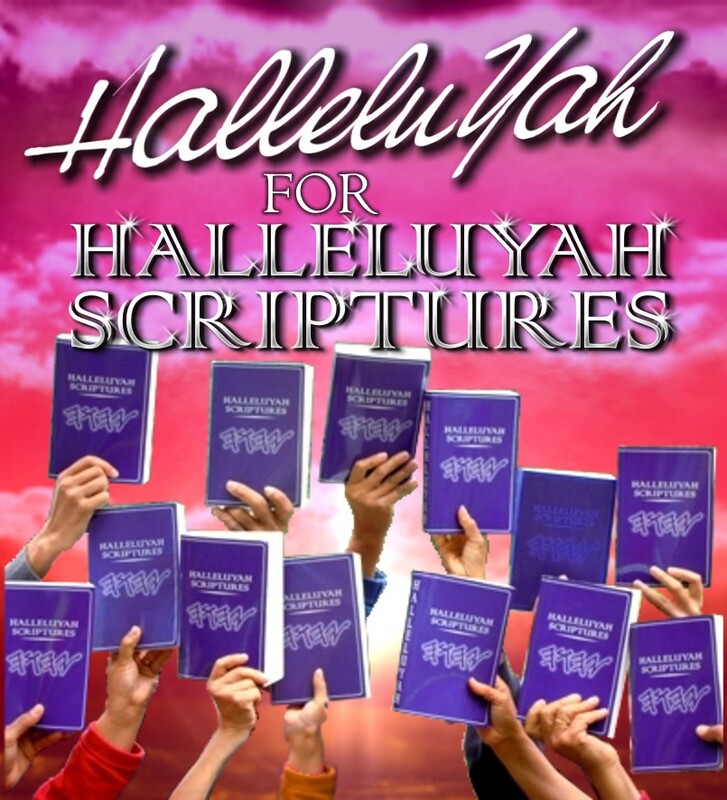 We need help to print this special print run that will get printed with the next HalleluYah Scriptures main print run to keep the print cost down and then it will get shipped directly to Yisrael. We have received a few donations for this special print run but are short by $5000.00 usa. Please help us get this special print run completed and sent directly to Yisrael. The group has taken a number of boxes with them to see them through until this special print run is delivered to them. Please keep them in your daily prayers, as this is quite the endeavor, halleluYah! 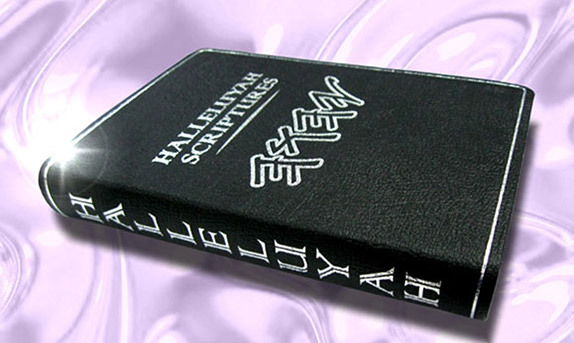 HalleluYah, a brother and sister have paid for a limited number of HalleluYah Scriptures in very high quality, calf skin leather editions. They are well-bonded with silver wording on the cover and silver-trimmed pages. 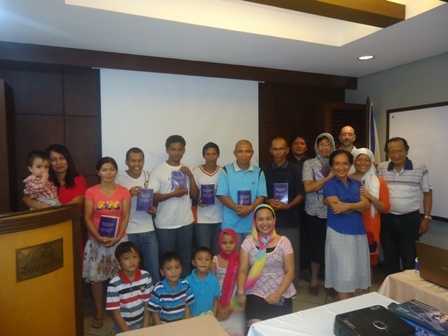 This special donation was for the express purpose of helping the project get enough funds to print 20,000 copies. The couple personally donated these copies and would like to donate a copy as a gift to each person that donates $500.00 or more to this important project, they are not for sale as they were gifted. Please know this was their choice to make this offer and indeed we have been “barak” that they have done this, halleluYah. There is limited stock of the leather edition so please help us get to 20,000 in our efforts to reach even more brothers and sisters worldwide. 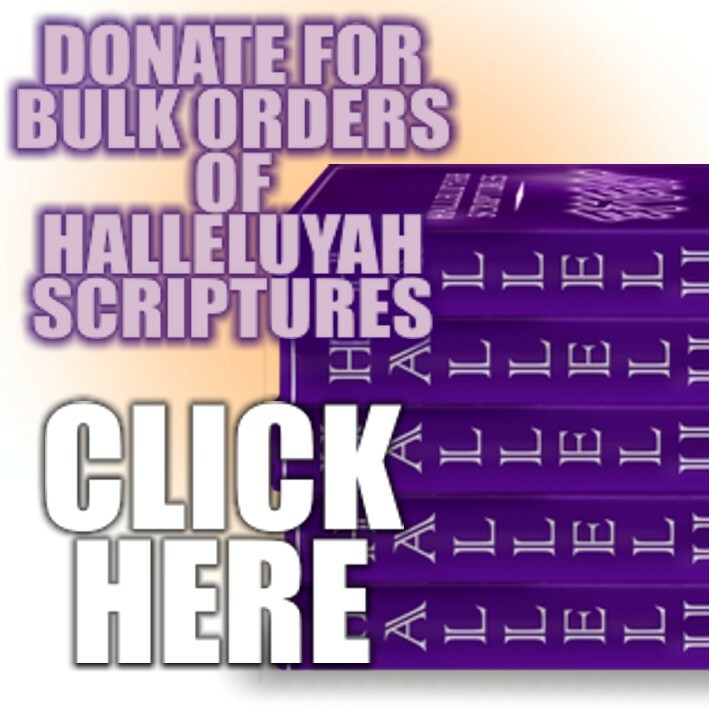 We feel led to print as many HalleluYah Scriptures as we can as we know there is a time when we will not be able to print so we need to stock pile as many for this time. All the bulk agents around the world are well aware of what to do when the internet is closed down and the hard times come upon the world, they are prepared and the Ruah has already shown us what will happen with His Word the HalleluYah Scriptures through this time. There is a famine of His Word coming and will be more of a famine at end times. For the 3rd print run, we would like to print 20,000. HalleluYah, we are close to the total for this upcoming print! As you all know all donations go to printing and shipping only, there are no other costs and you can see our public vow in our latest Newsletter. 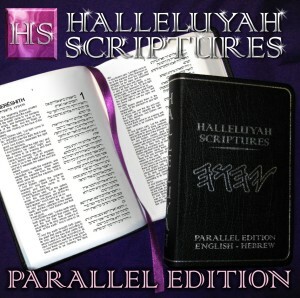 The HalleluYah Scriptures are not for sale and will never be sold and we will not use donations for any other use. If we have a special need come up like storage, etc., we ask for donations. Please help us get these latest two print runs completed so that we can help as many of His people as possible. Truly there is no better gift you can give His people, nothing greater and we can tell you first hand that these people praise the Father for your gift. His Word has all the answers. It has been an honor to do this work for the Father and you His people. 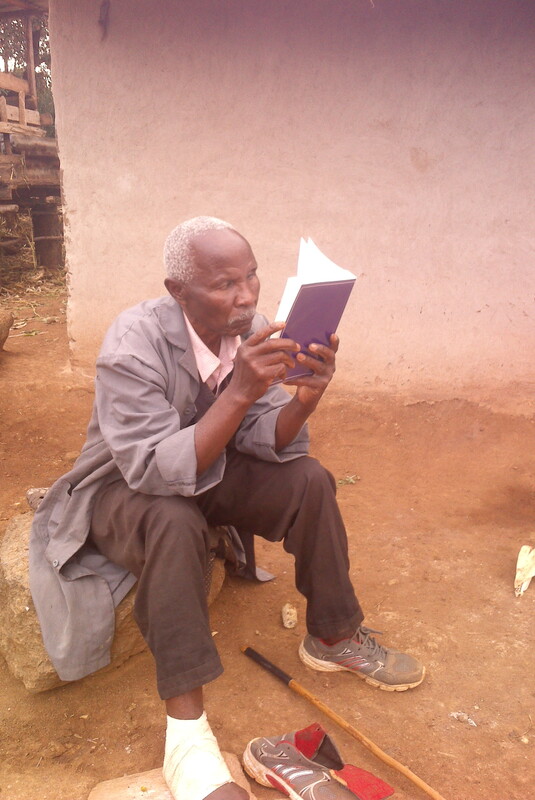 You are not giving to us, to whom He gave the vision, but to those whom desperately need His Word. 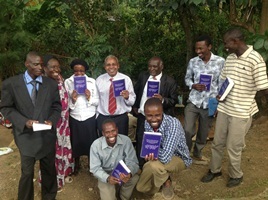 HalleluYah, the translation team has completed 3 new books and we would like to print them in hardcopy. These will be available at cost to His people. They will pay for themselves so no donations are needed for these books. 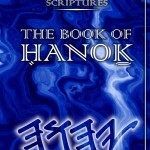 There is the book of Hanok, Yasher and Name Meanings. You order them if you would like any one of them. 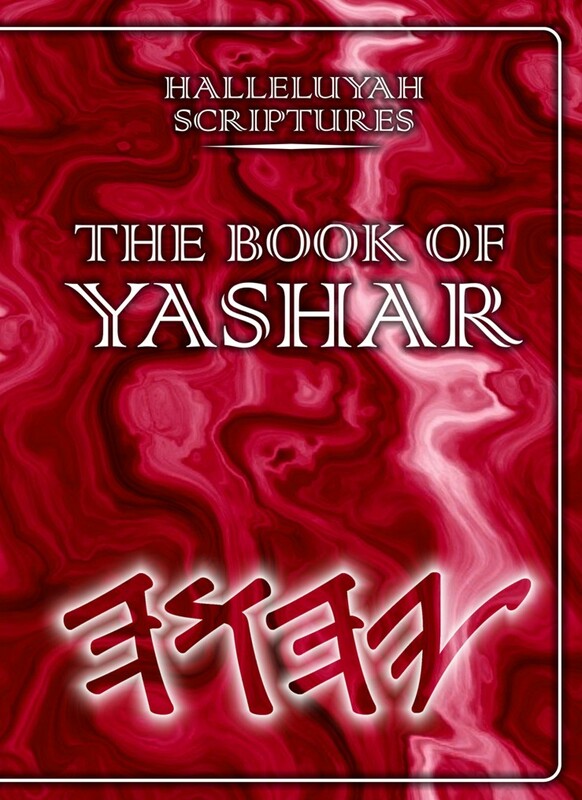 The book of Yasher is mentioned in Scripture and was found among the Dead Sea Scrolls. It deals from the time of Creation to the Exodus and sheds a lot of light on many of the events and people in Genesis, including Abram, Nimrod, Ya’aqob and his sons. 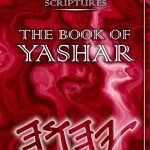 Although some of the original writings of Yasher show signs of embellishment by the scribes, it is an informative read. 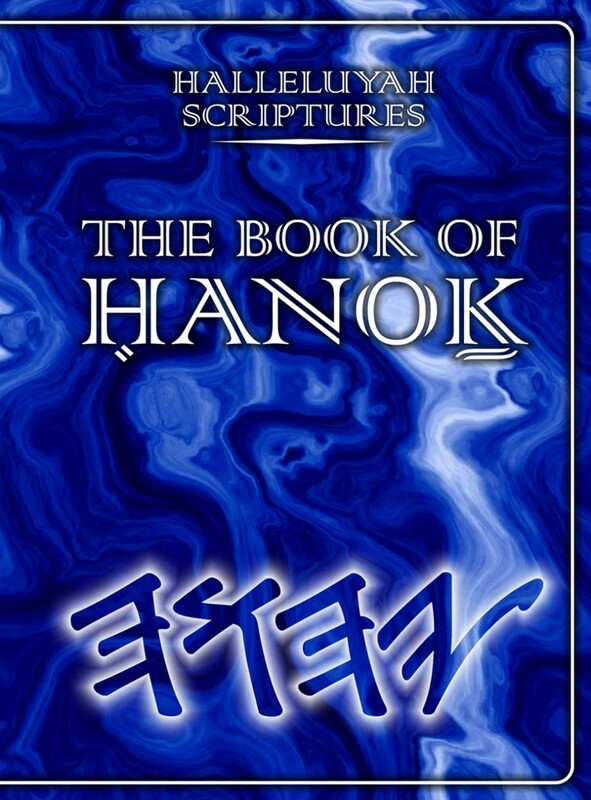 Both Hanok and Yasher follow the same formatting as the HalleluYah Scriptures: no footnotes, no added mans doctrines, all pagan words pertaining to the Father, Son and His people have been translated into Hebrew. 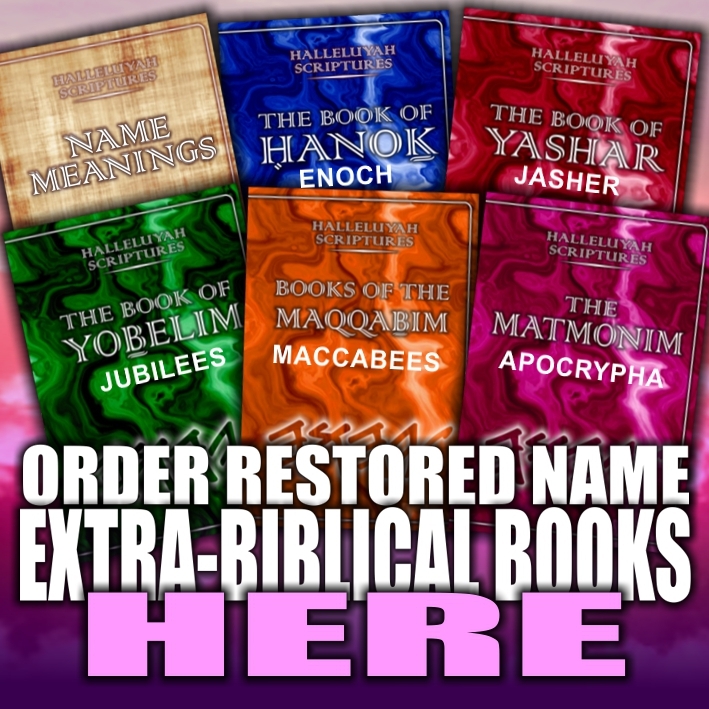 The Name Meanings book was put together over the period of time the translation team has been working on the HalleluYah Scriptures. 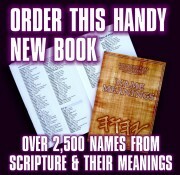 It has over 1200 names and places that are in the HalleluYah Scriptures. The Name Meanings is special as there is no other book like it. It is a very important tool for His people to learn all the names in Scripture. Truly, when a name is given by the Father it has a meaning and that meaning is important. 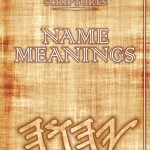 You will learn these meanings and gain real insight into why the Father gave some of these names. Furthermore, you will learn so much more of His Word and you will learn even more Hebrew! This is truly a berakah. 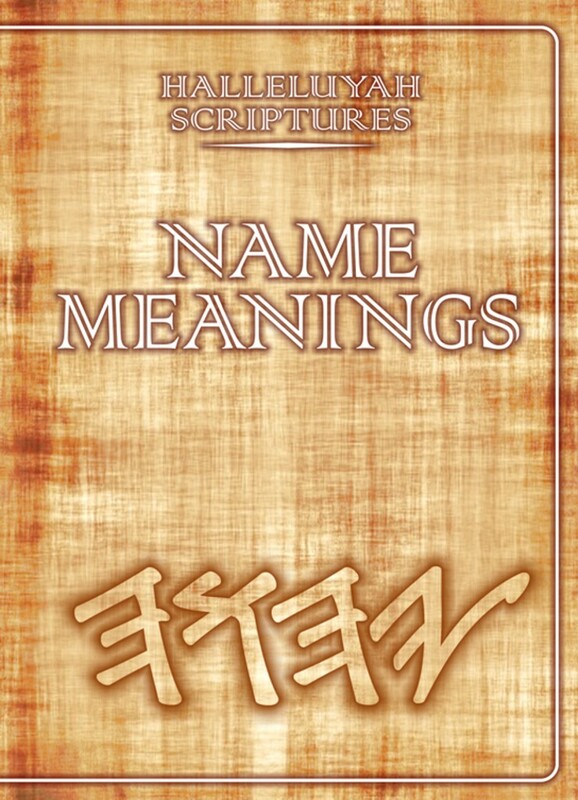 The Name Meanings book has been worked on for a number of years. We are asking for your donation to cover costs of printing/shipping/customs fees and shipping in and around the USA which for all 3 books is around $25.00us. 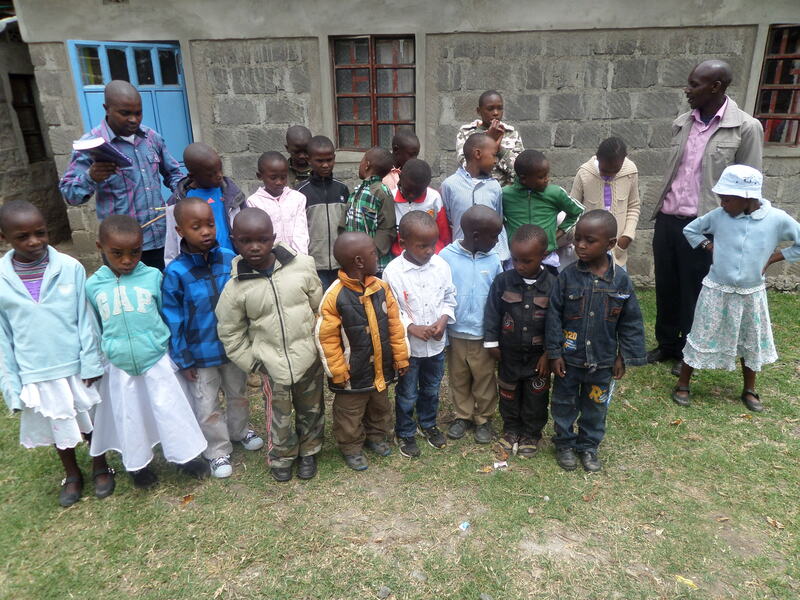 If you donate over and above this amount then it will go to the HalleluYah Scriptures project. If you would like to pre-order these books please fill out the order form below and make your donation. We need the funds first before we print so please do not wait until they are printed to make your donation. 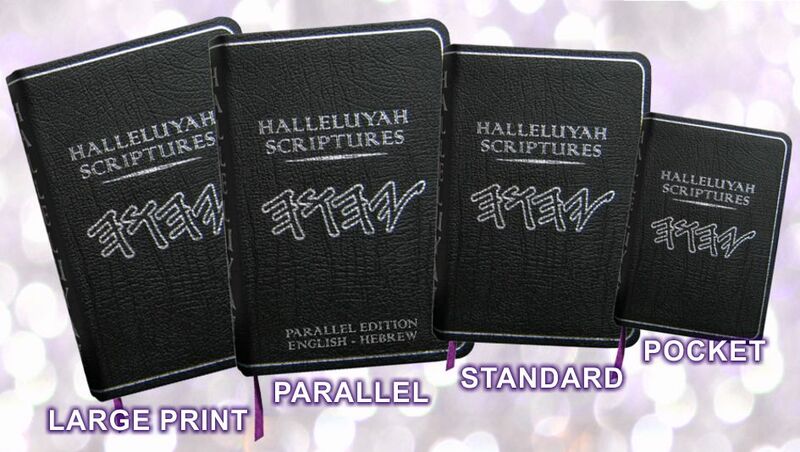 We want to print these books with the next HalleluYah Scriptures print run. The first print run will be of 500 copies so they are limited...please let us know asap! We are working on a new video to show you His people why the HalleluYah Scriptures is the purest and closest to the Hebrew than any other English version and the only version done according to Scripture. HalleluYah, there is nothing close to this translation. The translation team work full time on the HalleluYah Scriptures to bring the HS translation even closer to the Hebrew and to make it more pure. They are now learning Greek and Aramaic to get a better understanding of the RC. Many may not understand the work that goes into a translation. Just removing 80% of Italicized (added) words took a number of years as you cannot just take them out as it has to still be readable for a person, each word had to be examined and studied, every pagan word pertaining to the Father His Son and His people had to be translated into Hebrew as the Father made it very clear that He did not want any pagan words associated with Him, His Son and people, so these all had to be studied and researched. You will also see in the new video that more verses/words have been added as they were in the DSS but no other version has these. All we want is His Word as pure and as close as we can get to the Hebrew for His people! HalleluYah, Dr. Chris Koster started work on the Restored Name Scriptures in the late 60’s early 70’s and made excellent headway into the translation. The HalleluYah Scriptures translation team has taken it a step further bringing the translation even closer and purer to the Hebrew as stated above. The order of books in the RC follow the chronological order of their writings, NO other version has this. To our knowledge the HS is the only version to have the true Mount Sinai in its rightful place. Please know, the translation team works painstakingly to bring you His people the purest and best version ever to be put together all for His esteem, honor and praise….this video will give you a glimpse of this labor of love. 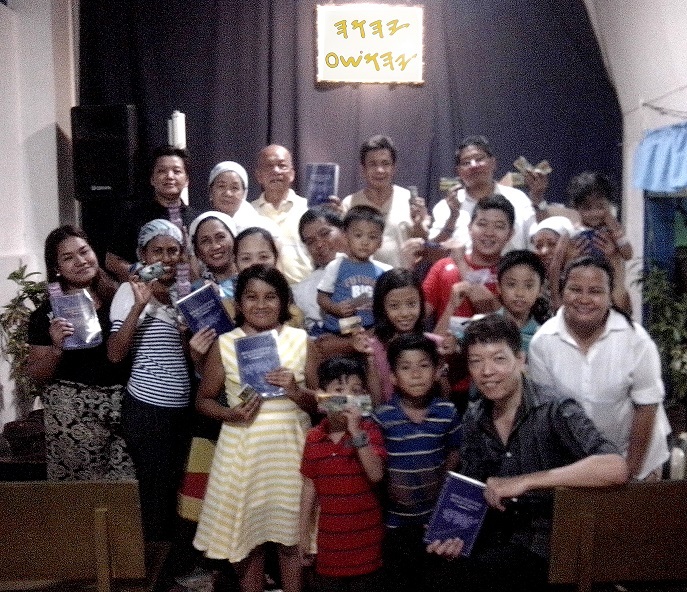 Who Are The HalleluYah Scriptures Reaching? As we sense and many of you write to us and confirm our sentiments, there will be a famine of His Word in the times to come. The Father has put such an urgency on our hearts to seek out brothers and sisters in countries that are not open to His truth and countries that people will come to know Him and His Son like Yisrael. 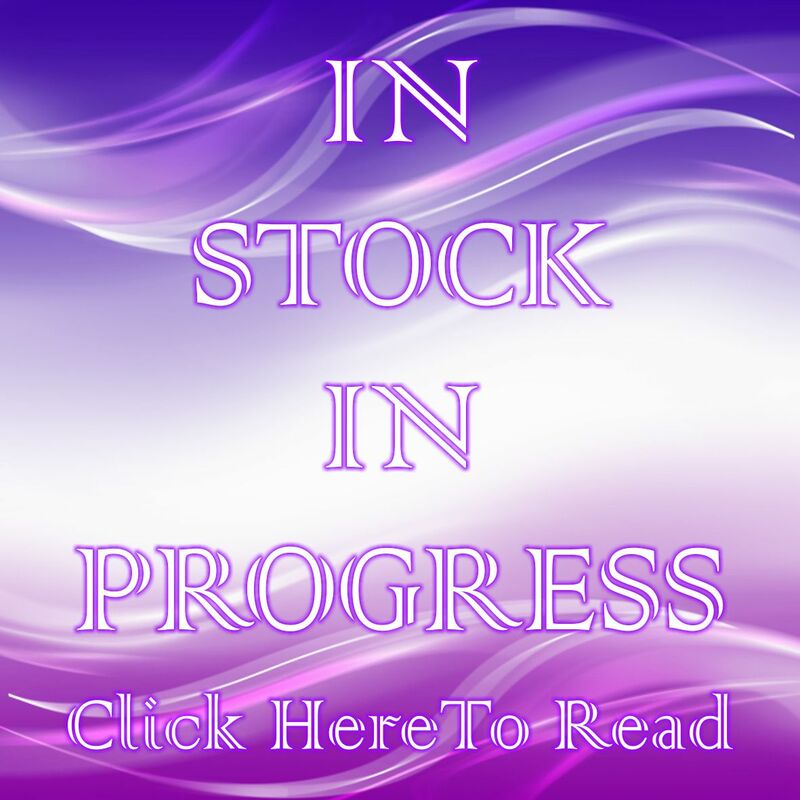 The countries we are working on and starting to get bulk stock to are: Yisrael, Africa, Malaysia, Russia, as well as new stock in the Uk and Australia and a number of other Countries, halleluYah. We are constantly in awe of how the Father has been leading so many people to us from different countries and races to either receive a copy or help to get copies into the hands of His people. HalleluYah, His Word is reaching every nation, tribe and tongue! As you all know there is nothing more important than His Word and getting it into the hands of those who desperately need it. 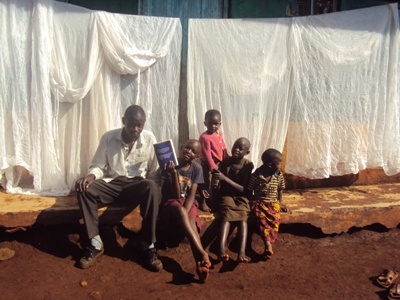 In light of the fact that so much is happening with this project--as the Father is indeed getting His Word the HalleluYah Scriptures to the 4 corners of the world!—we strive to keep you informed via the updates and newsletters via the website as there are so many miracles and such increasing urgency. 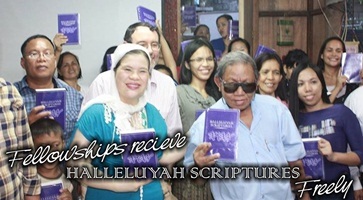 We ask that you keep your eyes on the HalleluYah Scriptures website regularly as this will keep you updated and encouraged as truly in just the passed year since the first print run, His Good News, the HalleluYah Scriptures has reached the vast multitudes, all over the globe, and the requests and locations are increasing daily, halleluYah! We receive many orders for prisoners and are pleased to send them a copy. We are working with a large Messianic Prison Ministry also to ensure that prisoners are taken care of and those who love the Fathers Name and learning to obey His Torah are receiving the HalleluYah Scriptures. Since the new shipment has arrived we also are now able to get more copies into prison libraries. 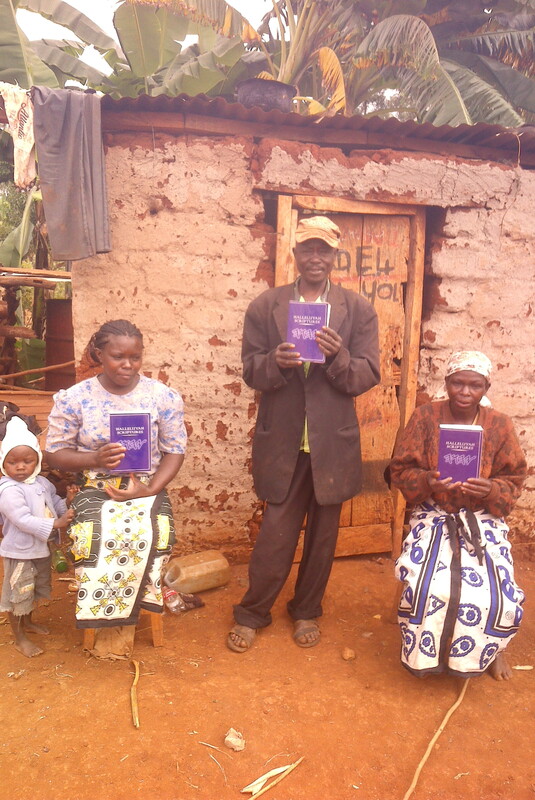 We were approached a while ago about this and through prayer were led by the Father to make contact with chaplins in each prison, introducing them to the HalleluYah Scriptures project. 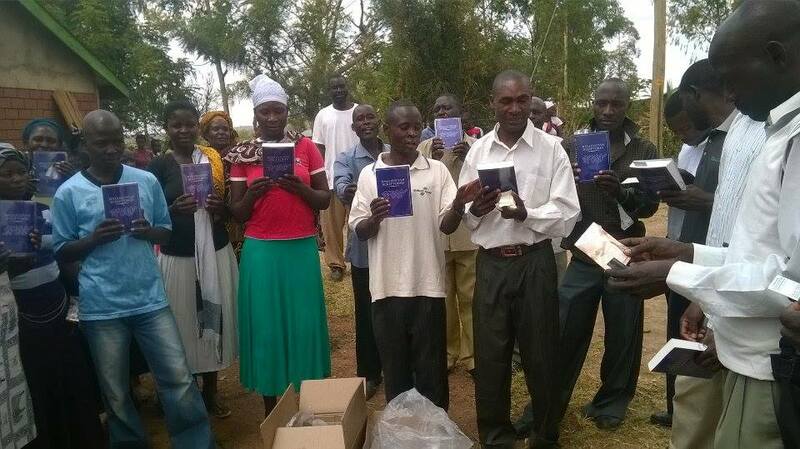 This way, they are able to make orders for interested brothers and sisters whom are prisoners and also get a copy of the HalleluYah Scriptures into the prison libraries, halleluYah. In any case, we are confident that the Father will lead prisoners who are seeking His truth to find the HalleluYah Scriptures and will make their own order if their Chaplin is not interested in the Hebrew Roots. But in saying this, halleluYah, we have had tremendous support, interest and cooperation from the prisons. We also have an alarming amount of emails from brothers and sisters whom are homeless. This has been heart wrenching to us as they pour out their sorrows to us. These are our brothers and sisters who love and use the Name of the Father and learning His Torah. They have fallen on hard times and some are on the street and some live in their cars. All they are concerned about is having a copy of His Word as it has all the comforts they need. HalleluYah, the Father knows who is His and He truly seeks the brothers and sisters out and leads them to this project or someone that knows about this project, and we are constantly in awe and amazement at how lovingly and faithfully He works in finding and feeding the down and out. If you are or know anyone that helps in prison or homeless ministries, those whom are interested in His Name and Ways, please contact us so that we may work with them in providing the Father’s gift of the HalleluYah Scriptures. 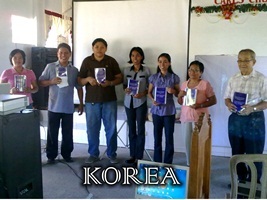 The Missons team is also working on seeking out His people in every Country. Two team members are working on the Middle East ,China and Russia as these Countries have believers who are in need of the HalleluYah Scriptures. 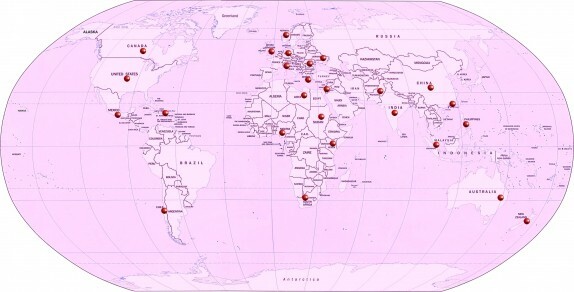 Other team members are working on India, Philippines, Russia, Africa, Malaysia and many other Countries. Please keep them in your prayers. 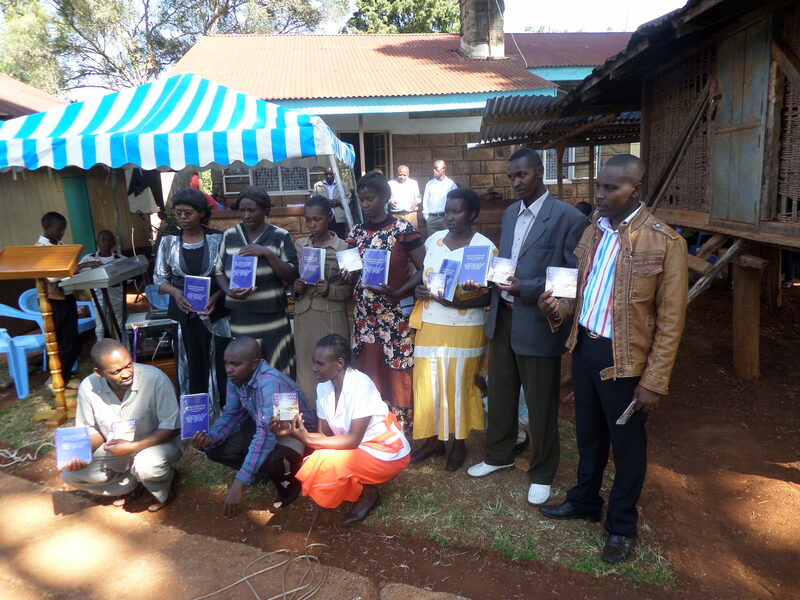 Also Prisoners and Prison Libraries are a focus of the Missions team. We are now sending out bulk to different Countries and have a number of His people in place. HalleluYah!!! 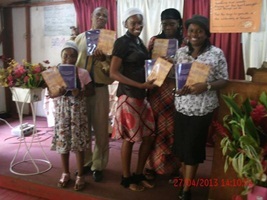 Around The World with The HalleluYah Scriptures! Many of you know the story of the young man that traveled the world, did a dance in every country, filmed it and it went viral online. 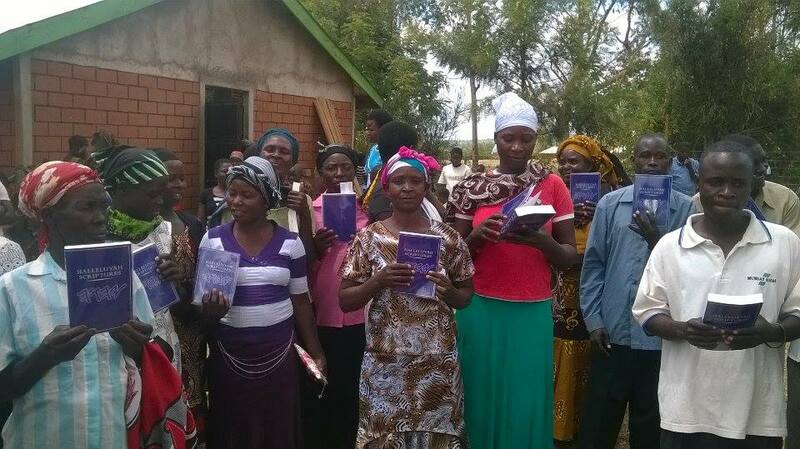 Well the HalleluYah Scriptures are traveling around the world and FAST! Truly the pace at which HS is progressing is feverish! 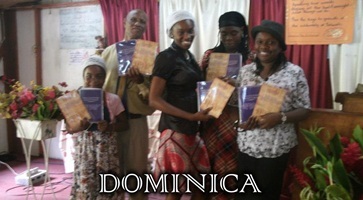 Our faithful Father is delivering them unto the farthest corners of the earth. 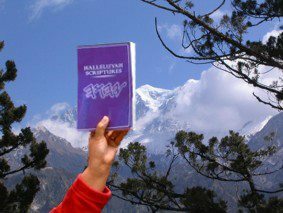 To give you a glimpse of this incredible handiwork, we are starting a new page called "Where are the HalleluYah Scriptures?” We are looking for believers to hold up a copy of the HS near a landmark in their country (no idols please). This way we can all see where they are, sharing in the joy of this incredible testimony of His love for His people. HS has gone forth unto Russia, Philippines, China, Japan, Africa, Middle East, Yisrael, Australia, NZ, Ukraine and many other countries, halleluYah indeed! This picture is from Nepal as some copies were sent there. So please, send us your photographs for a special page on the HS web site. Oh and don’t worry about posing pretty for the picture or getting all dolled up, just your arm holding the HS will do! In this way privacy is protected for those whom are in dangerous areas and above all, the Father receives all praise, honor and esteem for what He has done. Thank you and HalleluYah!!! A Sincere Thank You, halleluYah! Thank you, halleluYah, it is an honor to work for the Father and you His people. We promise you that we give all we have to this project in time and energy. We are dedicated to this task and rely on all of the Father’s faithful for support and encouragement. 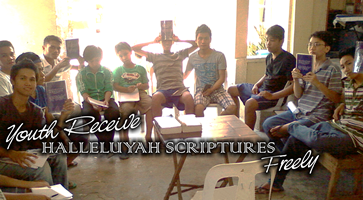 The HalleluYah Scriptures would be nowhere without such love and generosity. We rely heavily on prayer and fasting as we cannot get through without these tools. We thank you, halleluYah for the over 500 of you scattered all over the globe whom join us in our monthly prayer and fasting, as well as our dedicated daily prayer group of believers that have committed to continual prayer on behalf of this project. The Father led us to put together these two groups to pray and fast monthly and/or daily, as it is of the utmost necessity to be covered in prayer by His faithful and be guided by His Ruach. Truly, since putting this in place, we have seen the Ruach move in remarkable ways, halleluYah. 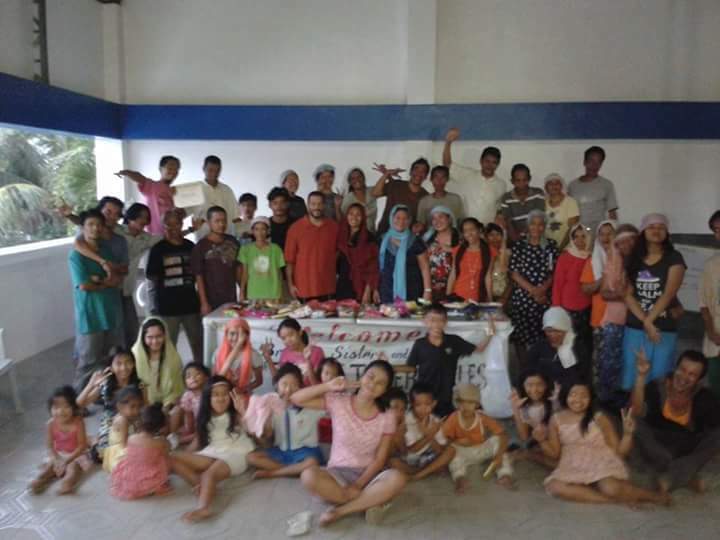 We give all our time and efforts to this endeavor, striving to do the best we can for the Father and you His people. Please, although appreciated, we do not seek thanks, as we are nothing but His vessels, may all praise, honor and esteem go to the Father as He is the one that has put this important project together. Please know, all the genuine, heart-felt efforts of each of you our supporters have taken this project from a vision to a reality, halleluYah! Be assured, we pray for each of you daily and we mean this as we take this very seriously and we are extremely appreciative and praise the Father for the multitude of His children that have been raised up to share their time, energy, resources, thoughts and lives with the HalleluYah Scriptures. HalleluYah from the team at HalleluYah Scriptures!